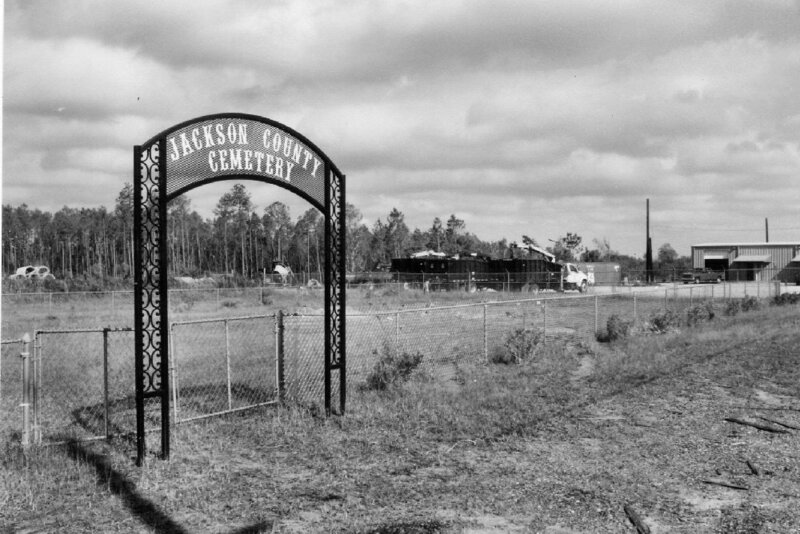 LOCATION: The Jackson County Cemetery is located on Seaman Road approximately 5.5 miles north northeast of Ocean Springs, Mississippi in the SE/4, NW/4, of Section 29, T6S-R8W. The burial area is situated on the east end of 200-acre tract owned by Jackson County, Mississippi, which includes a 10-acre landfill. DIRECTIONS: From the intersection of Bienville Boulevard (U.S. 90) and Washington Avenue in Ocean Springs, Mississippi go north on Washington Avenue 2.1 miles to Seaman Road. Turn right (east) on Seaman Road and go 3.4 miles northeasterly to the Seaman Road Cemetery, which is located on the left (west) side of the road. There is a hurricane fence around the cemetery. The Board of Supervisors dedicated .34 acres (296 feet by 50 feet) to the cemetery, and platted 230 gravesites. A fenced area approximately 72' x 138' encloses the present cemetery which has had eleven burials to date. The first person buried here was Robert R. Patterson who was interred on February 13, 1995. It is interesting to note that each indigent burial to date has been recorded in the land deed records of Jackson County, Mississippi. This should provide an excellent record of those buried here through the years. Anyone interred here will be recorded in Sectional Index Book 44A at the Chancery Court of Jackson County, Mississippi. Jackson County, Ms. Land Deed Book 1101, p. 544-Lot 13. Jackson County, Ms. Land Deed Book 1064, p. 64-Lot 4. Jackson County, Ms. Land Deed Book 1062, p. 707-Lot 3. Born at Abbeville, Alabama. Jackson County, Ms. Land Deed Book 1093, p. 315-Lot 10. 9009 Travis Avenue, Ocean Springs, Ms.
Jackson County, Ms. Land Deed Book 1093, p. 833-Lot 11. Jackson County, Ms. Land Deed Book 1061, p. 582-Lot 2. Jackson County, Ms. Land Deed Book 1082, p. 432-Lot 7. Jackson County, Ms. Land Deed Book 1060, p. 881-Lot 1. Jackson County, Ms. Land Deed Book 1081, p. 432-Lot 6. Jackson County, Ms. Land Deed Book 1101, p. 543-Lot 12. Jackson County, Ms. Land Deed Book 1106, p. 156-Lot 14. Jackson County, Ms. Land Deed Book 1091, p. 370-Lot 9. 7430 Old Stage Road, Moss Point, Ms.
Jackson County, Ms. Land Deed Book 1067, p. 596-Lot 5. Killed by auto on Biloxi-Ocean Springs Bridge. Jackson County, Ms. Land Deed Book 1084, p. 648-Lot 8. The Mississippi Press, "County plans to spruce up indigent cemetery in Latimer", April 12, 1995. The Sun Herald, "Residents decry cemetery's neighbor", February 9, 1996, p. C-1. The Sun Herald, "Jackson County considers paying more for burials of indigents", November 8, 2011, p. A2.